Ipso and Malteser Werke launched a cooperation project in November 2018 to jointly extend psychosocial care of refugees and migrants in Mecklenburg-Vorpommern (Germany). The counselling takes place by refugees and migrants for refugees and migrants in their respective native language. The project encompasses a 12-month practice-oriented training in Rostock, in which we qualify motivated and suited candidates with a migration background to become psychosocial counsellors through the Ipso approach. Subsequently, some of the alumni will complement Malteser’s migration work with multi-lingual psychosocial counselling services. High quality is being ensured through continuous professional supervision by psychological specialists and Ipso. 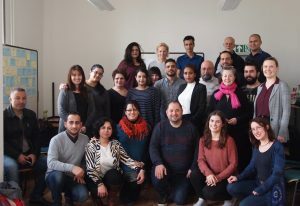 The training started on February 25th 2019 with 20 participants from 11 different nationalities.